One of the views of the Cosmopolitan Casino's Chandelier Bar! When I signed up for the Identity player's club card at Cosmopolitan on January 10th, I showed my Grazie gold card to the desk and asked to be upgraded. They said I would have to speak to a host and tried to reach one, but for some reason they were having a lot of trouble that evening finding a host that wasn't busy, so eventually by phone one of the hosts said to go ahead and upgrade. My friend Socalgirl was previously upgraded by a host too by showing her Gold Grazie Card and I've heard from others that CET's diamond card should also get upgraded. Excuse the finger below but it's hiding my name and number, however that's what the Gold Identity card looks like. When the details of Cosmopolitan's player's club "Identity" went online on their site, the following was posted as tier benefits. They no longer seem to be online so perhaps they are no longer accurate? When I return and stay there over Valentine's Day weekend, I will try to verify the following. As a member, you accumulate Identity Points on all types of spending at The Cosmopolitan: be it dining, spa treatments, entertainment, gaming… or simply staying a night with us. So, it’s more than slots and table play – you earn Identity Points for all your favorite experiences, too. Our members’ passions and preferences vary. That’s why Identity Membership lets you choose from a rich variety of benefits – great experiences that you’ll find only at The Cosmopolitan. 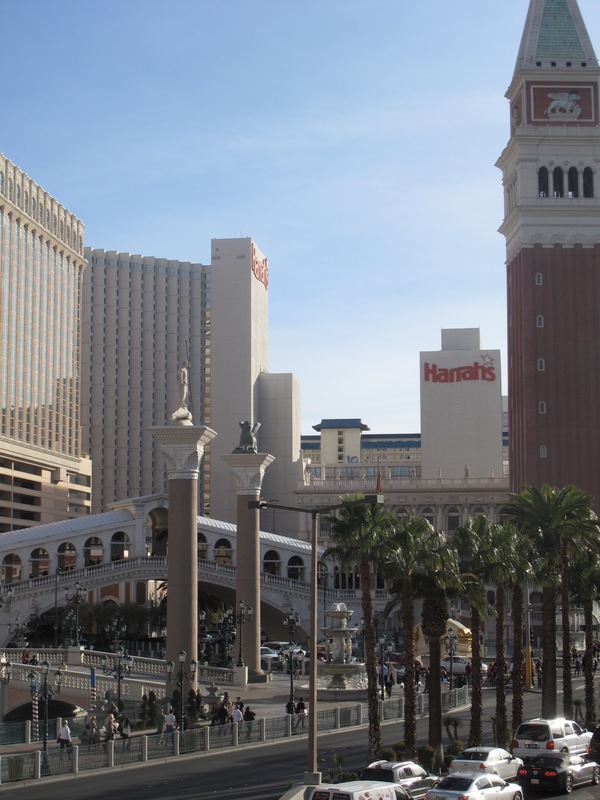 With Identity Membership, you get a free night after staying just 8 nights at The Cosmopolitan. And since you earn points for your spending on experiences and game play, you’ll rack up Points faster than you do with most other Vegas membership programs. Identity Membership makes it easier for you to earn access to a personal host. Because we recognize your spending on experiences as much as slots and table play, you don’t have to be a high roller to reach Platinum status… where a personal host will treat you to the utmost in hospitality. To qualify, simply enroll… for free. Qualify by earning 20,000 Identity Points in a 12-month period. Qualify by earning 80,000 Identity Points in a 12-month period. Jaleo's menu, click to enlarge. Tapas restaurants are all the rage these day on the Vegas strip as the last 8 weeks has seen Mandalay Bay's, Fleur De Lys restaurant by Hebert Keller turned into Fleur a tapas restaurant, La Cave opened at Wynn and now Jaleo by Jose Andres has opened up at the new resort Cosmopolitan. Jose Andres, original Jaleo restaurant in Washington DC has been one of the most successful tapas restaurants in the country now for almost two decades. Paella station below during a quiet period. Usually there was about 3 chefs around there cooking and it can get a bit warm if your table is in that general seating area. There was three in our party, Alaska, myself and Socalgirl whose birthday we were celebrating. We were seated at a comfortable booth raised up a level but close to the Paella station. Since we had already had a couple fine cocktails in the Cosmopolitan casino I was the only one to order a drink and my deconstructed Clementine Martini was marvelous. There's a short video of our server preparing it in the video clip section of my blog. Don't think the deconstructed part was just a gimmick, the drink itself was great just the right amount of sweet and sour and I would order it again. We ordered a lot of plates among the three of us to try. The first to arrive was the pan con tomate which was a excellent bruschetta but nothing that stood out from ones I have had at other restaurants. Croquetas de pollo, traditional chicken fritters is in the above photo. They were tasty and a good choice for anyone who likes more meat and potatoes type of food. Chocolate Souffle Dessert at Wolfgang Puck's Cut restaurant at Palazzo. We went here for dessert after being disappointed with our entrees at Mandalay Bay's Strip Steak restaurant. Video of deconstructed Clementine Martini at Cosmopolitan's Jaleo restaurant. In the video he mentioned the candy was for after drinking the martini but later our other server told us you eat small tastes of the candy while drinking the martini. Loved the martini and would order it again. Will post a review of our dinner at Jaleo soon. The lowest win of the trip on $5 Wheel of Fortune at Palazzo,but the only one I remembered to take a short video of while spinning. Later today or tomorrow I will upload the 3 bonus rounds of the new Star Wars Doid Hunt Slot to youtube and link them here. I'll still be writing a full trip report of January's trip next week but in the meantime thought I would post some photos and video's of the trip. 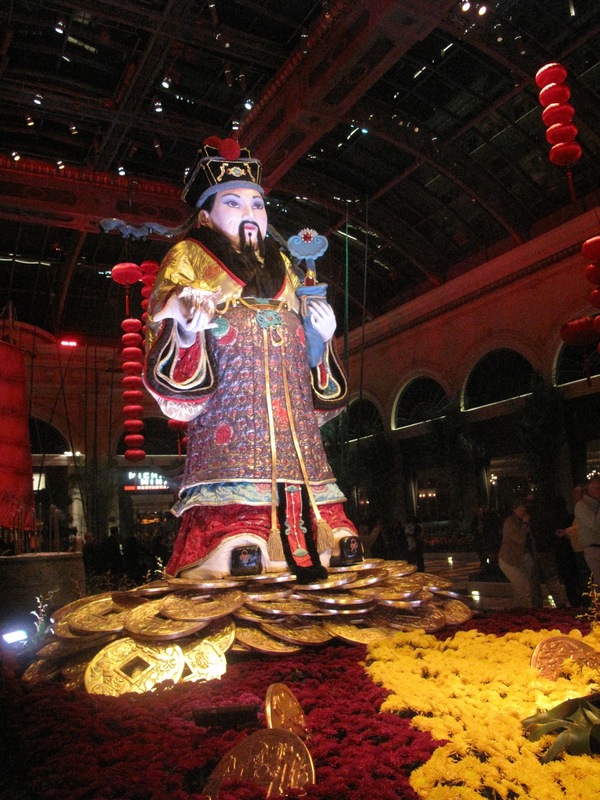 Above and below is one of the scenes from the Chinese New Year theme at Bellagio's conservatory. 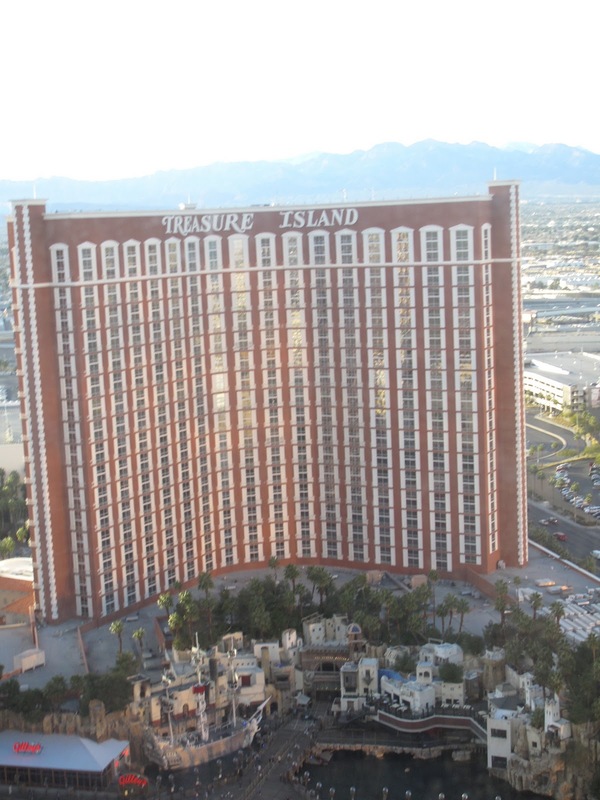 Views of Treasure Island from my Palazzo suite are below. Weather was great during this trip, perfect walking weather and no wind at all while I was there. Above was some of the musician's who had performed at Palazzo for the opening of the Chinese New Year's theme, posting for a photo op. Video below shows the Rabbit eyes, tail and paws moving. One of the views from the bridge that crosses over from Palazzo to Mirage. Above is another view from that walkway. Inside Venetian near the restaurants, shops and gondola ride. Short video of Gondola docking at the end of their ride with the gondolier singing. For some reason when I was there most of the gondolier's were not singing as the gondola's went down the canal. The Gold Lounge at Venetian served a variety of appetizers during my stay. On Friday it was chicken fingers and egg rolls. 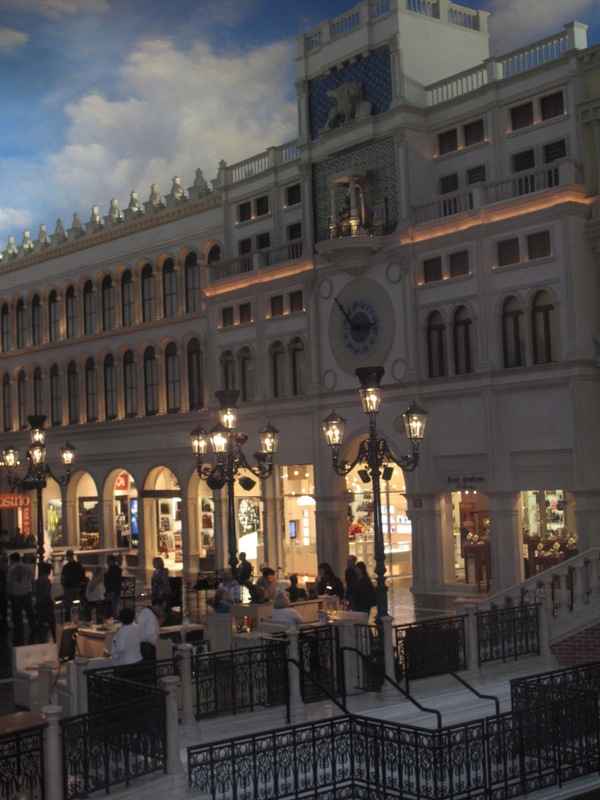 Very short video of the car and slot machines they were putting in place at Venetian. This was the 3rd day I saw them working on it, I guess it takes a really long time to put something like this in place. One of the slot attendants was joking with me they had to change the other car out because due to lack of anyone winning it through the years it was becoming vintage. 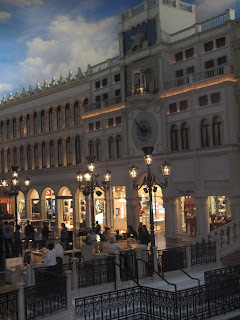 Palazzo was very crowded this week, here's people just sitting around the fountain area resting their feet. Tomorrow I will upload some gaming videos! It's the year of the Rabbit and this is Palazzo's Chinese New Year's display that was just put up. 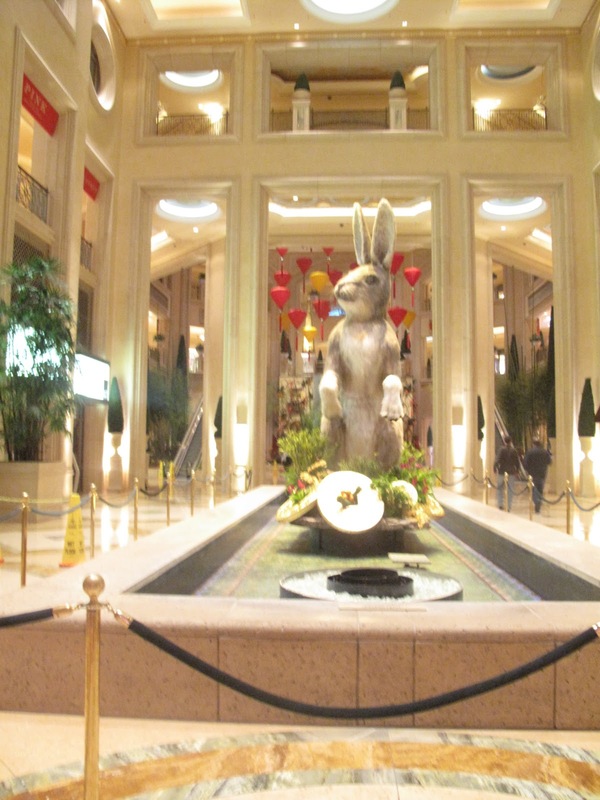 The rabbit is cute and electronic as the paws and tail moves. Gambling wise I was holding my own today and as my host mentioned to me today I was breaking even at Palazzo and Venetian. What he didn't know was the money I lost at Cosmopolitan, Encore and tonight at Mandalay Bay. Above is my new M life platinum player's club card. Date says it's good for March 2012. I'm not very impressed yet with their benefits for what purports to be the highest level tier for M Life. My benefits that I get with the gold card I was upgraded to at Cosmopolitan seem better. Above is the shrimp cocktail I enjoyed at Strip Steak tonight at Mandalay Bay. Socalgirl and I were not impressed with Strip Streak we prefer Cut or Carnevino for both atmosphere, service and quality of food. 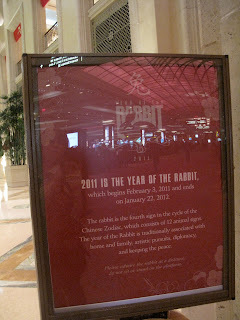 More photos and opinions of our dinner will be in my full trip report. One of my few decent wins today was on the new Star Wars Droid Hunt. 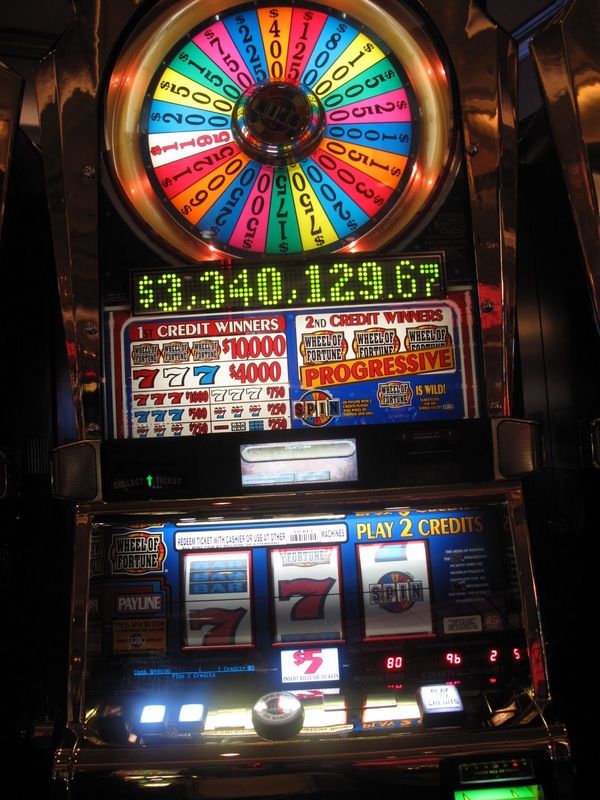 The game is really fun when the bonuses are hitting, but isn't that the case with most slot play? I had tons of bonuses tonight on the original Wizard of Oz at Palazzo. Unfortunately they didn't pay much and at one point I had Glinda visit me 3 times in a row which was a record for me. I'm tired and going to sleep early tonight for me. Tomorrow the plans are to meet my friends Sharon and Denise and spend most of the day and early evening with them. We will be going to Bellagio and Cosmopolitan and possibly Aria too. Sorry I'm late with my summary but I've had a few connection issues this trip with the internet. Having a great time so far, though of course it would be better if I was winning more, but that's always the case. Full trip report will be posted next week after I return home and have time to recover. Tuesday when I arrived in Las Vegas I had time to unpack and gamble for about a hour before I met up with Socalgirl and experienced Cosmopolitan. Gambling started out well with my first few bets resulting in a nice win on $5 WOF. 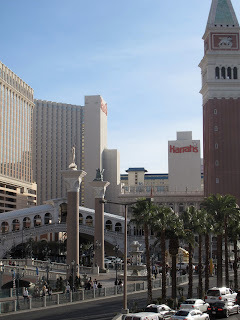 By the time we left for Cosmopolitan, I was ahead about $600, but unfortunately Cosmopolitan slots were like a hoover for me and by the time we returned to Palazzo I had lost those winnings. First impressions of Cosmopolitan was it was designed for those of us who like bling and glitz. Second impression they still have some service issues to work out but understandable given how new they are. I was upgraded to the Gold Identity card, but it took quite a while for them to locate a host to do that for me. Above is a photo of one of the Blackjack gambling cabana areas. 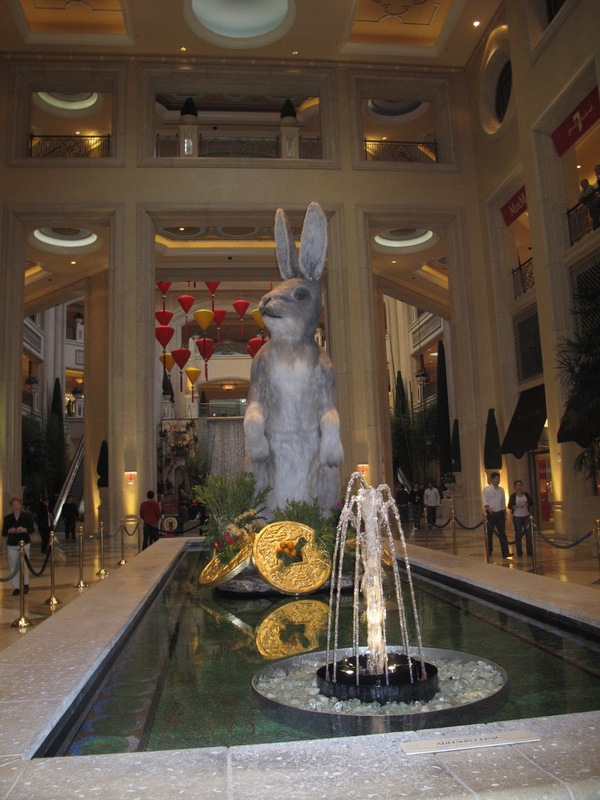 Unfortunately I lost my eyeglasses around here or the chandelier bar. Still hoping that someone will find them and turn them in to lost and found. Alaska and I are at one of the tables at the Chandelier bar. Unfortunately the three of us couldn't get any service at this table. We finally moved to one where we could get a server's attention but it turns out they were changing drink menus and we didn't like the current one as much as the other one we had in our hands and given the lack of service we left and decided to go downstairs and get a drink from the casino cocktail waitresses. This turned out to be a great idea as Cosmopolitan does serve wonderful free drinks, try the chocolate martini or their signature Cosmopolitan drink. My four favorite places for free drinks based on the quality of the drink is Wynn/Encore, Cosmopolitan, Aria and Bellagio. Above is the Paella station at Jaleo. We loved Jaleo, don't hesitate to eat there if you like what you read on the menu. I'll have photos and descriptions in my full trip report but we loved everything with the exception of the lobster paella that Alaska ordered because it was salty, too fishy tasting and the lobster pieces were that nice. Socalgirl's vegetable paella on the other hand was delicious as was my lobster salad. My photos have stopped uploading due to those connection issues, sorry about that. Anyway after dinner we said goodbye to Alaska and Socalgirl and I went off to try and locate my eye glasses which I realized at the end of dinner were missing. Failing to locate eyeglasses we went back to Palazzo where I continued to lose until around midnight when my luck started to change. By the time I retired around 4am or so, I was even. One fun surprise that evening before Socalgirl left Palazzo to go home was I had a hit on Wolf Run for $200 plus and a man standing nearby started to talk to me about it and during our discussion it turns out we are both member's of the slot machine forum. What a small world it is sometimes and what a coincidence to accidentally run into each other. Today, my friends Denise and Sharon arrived. We ended up gambling a bit at Encore and eating dinner at Society Cafe. Well, I ate dinner, shrimp cocktail and scallops which were wonderful. My friends had the tomato bisque soup with pretzel bread. Our server was excellent and so funny, very entertaining. After that we wandered around the shops at Venetian and they headed back to Harrah's were they were staying. If you have been reading Twitter my gambling has been a roller coaster. I've had some very nice hits, especially the $1000 tonight on the $5, Wheel of Fortune but can't quite manage to get ahead. Tomorrow I will be with my friend Denise early afternoon and I might gamble at Harrahs. Late afternoon and evening I will be with Socalgirl. 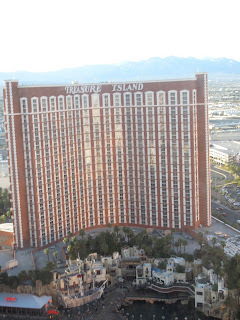 Thursday Denise, Sharon and I will likely be at Bellagio and Cosmopolitan. Hopefully my internet connection will improve so I can continue with the live report.